Both of these freight car kits are produced by Funaro & Camerlengo. The gondola kit was summarized in 2013 here on the blog. Both of these kits are solid starts for a modeler entering resin kit building. If you have built a Red Caboose X29 box car or a Proto2000 tank car, you should have no trouble building either of these F&C kits. 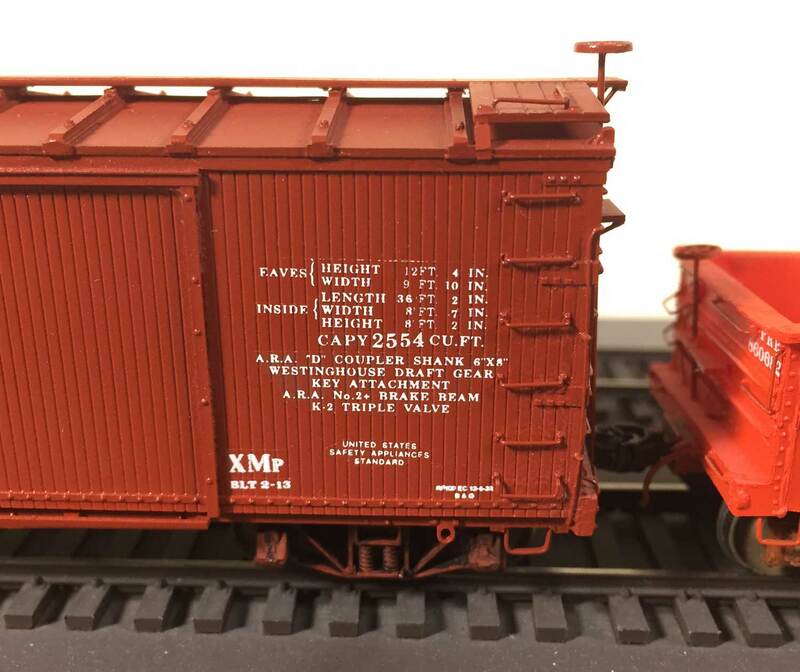 The box car kit represents a Reading XMp class, 36-foot car. 2000 cars were built by AC&F in four lots between 1910-1913. Over 1800 of these cars were still in service in 1940. In the early 1920s, the Reading rostered 10,000 36-foot box cars among several classes with many similarities. In decaling this model, the kit supplied decals were used for the large READING, the car number, the car class, the reweigh location and date, and the end reporting marks. The rest of the decals came from other sources. Photo scan from the F&C kit directions. As mentioned in a recent blog post, the lettering guidelines were changing through the 1920s. The kit directions include the above prototype photo. The car has a 1928 reweigh date that illustrates the earlier lettering. This was used as inspiration to decal my model. As you can see in the image above, there are many lines of data that document hardware components installed on the prototype car. We are fortunate that Rail Graphics produces generic data sets for different eras. Set No. 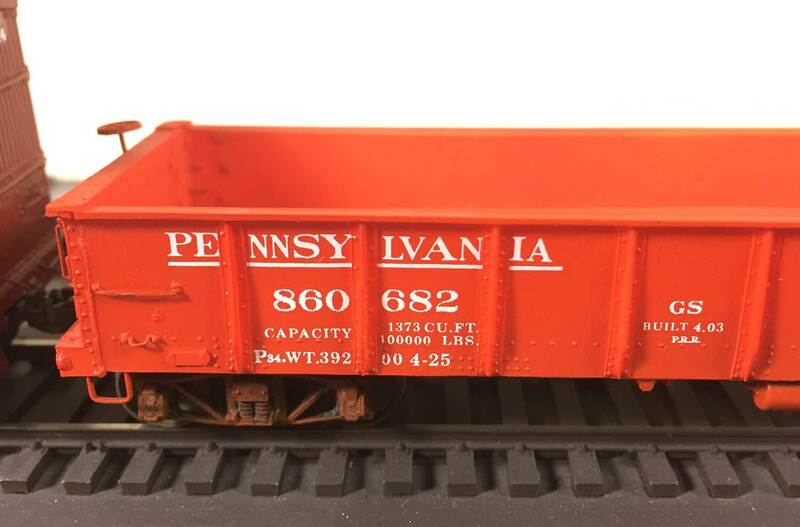 107 for 1900-1920’s Freight Cars, and set No. 108 for 1920-1940’s Freight Cars are valuable tools to keep at hand. 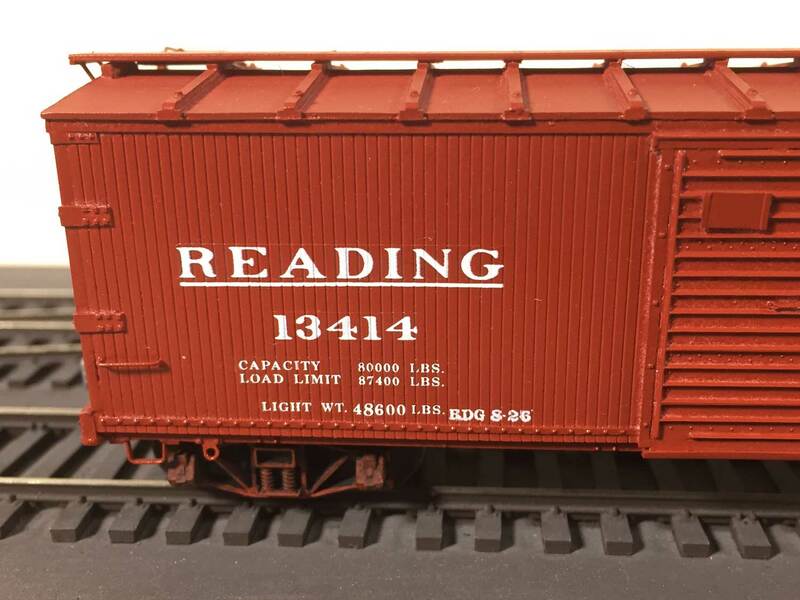 Nearly all of the extra lettering for this Reading box car kit was harvested from the Rail Graphics generic data decal sheets. The lettering does not mimic the prototype exactly, but it is very close and conveys the proper look to the model. Parts of the decal were separated so they could be placed similar to the prototype. All of those IN initials were not in line on the decal sheet. The CAPY numbers are also individually applied as the number 2554 was not printed as one unit. While tedious, using magnifying lenses and a toothpick for gentle nudging made the application pretty easy. Once you do one or two of these, it becomes less of a chore. By the way, the small repack data in the lower right corner came from a Westerfield set for a previously built box car model. Do not throw away older decal sets after a model is completed. There are always parts that can be used and a small Ziploc plastic bag takes up very little space in your decal drawer. The Pennsylvania Railroad built four variations of the GS gondola design between 1902 and 1909 totaling 25,752 cars. Some were originally built with drop doors and hopper doors in the floor to facilitate unloading of coal and aggregates. Over time, many were rebuilt with tight ends and floors for the GS class. Many of these steel gondolas were in service through the 1950s. Image from the Cleveland Memory Project of the Michael Schwartz Library at Cleveland State University. In reviewing the decals before starting the work, I noticed there was no data for a mid-1920s appearance. I also noticed the letter spacing followed later Pennsylvania Railroad practices. I used the above prototype photo as inspiration and the letter N in teh road name is narrower than what the set provided. I scanned the set and printed it out then cut out the letters to check the fit on the model. I had noticed this skinny N used on a Westerfield set for the USRA box cars, so that was also scanned, printed, and cut out to check the fit. I was lucky as the decals would fit the car properly. The road name, line under the road name, the P34 reweigh location, and the very small P.R.R. came from the Westerfield set. 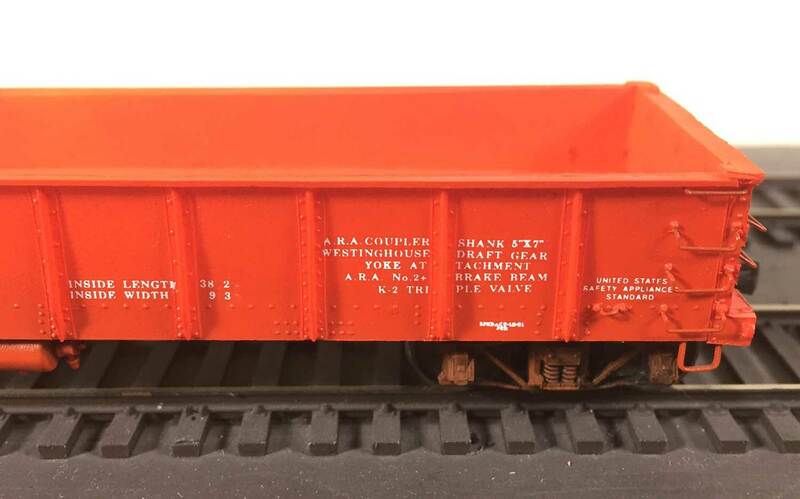 The Mount Vernon set provided the end reporting marks, the GS car class, and the repack detail. All the additional data came from Rail Graphics generic data sets. There were many individual numbers applied on this model. Each of the data lines seen above had to be applied separately as the decal sheet did not space them to accommodate a side stake. Patience, a steady hand, lots of decal set, and my trusty toothpick were used to position each of the decals so the model reflected the prototype. Here’s a link to another great image that was discovered just after the decal work was done. This 1933 image shows a couple of GS gondolas with lettering that followed newer guidelines but there is one weathered warrior visible at the right with the older style of lettering. Note the car retains the original arch bar trucks, too! Two more cars are now decaled and ready to roll through the weathering factory. The decal work was a challenge but the Rail Graphics generic data sets were a major assist in completing the models. The work was not difficult, just tedious. I took many breaks and the models were not finished overnight, but they now reflect the 1926 prototypes much better with the extra effort. Several months ago I attempted to re-supply my stock of the RG data sheets and was informed they were no longer being produced. Too bad they were much easier to see and cut than the MicroScale versions.